The American Red Cross is where people mobilize to help their neighbors—across the street, across the country, and around the world—in emergencies. Shanquell Johnson was in the kitchen prepping a turkey dinner for her family on the eve of Thanksgiving. “Then the whole house went black, and then flames came through the walls,” she said. Shanquell, her brother, and her four children: 15-year-old Shavon, 12-year-old twins Jachi and Jacruri, and 10-year-old Jakyla, left everything behind and ran outside. They had moved into their home in the Roseland neighborhood on Chicago’s South Side just the month before. They were unpacked and settled and looking forward to the spending time together in their new home during the holidays. 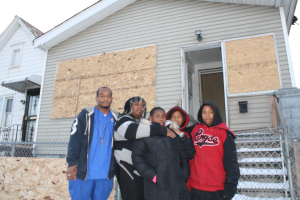 Shanquell returned to her scorched and boarded up home on a cold December morning to salvage what few items were left scattered inside the ruins of her living room. Finding a new place for her children to live was the only item on her Christmas list. Like the Johnson family, so many people are in need during the holiday season. But the Red Cross is there, responding to 3 to 4 home fires every day in the Chicago region to help families recover. Volunteers find shelter, food, clothing, replace medications and offer mental health services to talk people through the stress of coping with loss. Shanquell and her children stayed with family and friends, but on the night of the fire, the Red Cross responded to help with her family’s immediate needs. Volunteers gave the Johnson family the means to purchase food and warm clothes like coats and socks and find a safe place to sleep. “I’m thankful for that, otherwise we wouldn’t have had a place to go,” she said. Donate to the American Red Cross to help us provide assistance to families in a moment of great need. This #GivingTuesday, consider the American Red Cross for your gift and your contribution will make an impact, whether you donate $5 or $500. Every little bit helps. The American Red Cross is where people mobilize to help their neighbors—across the street, across the country, and across the world—in emergencies. Each year, in communities large and small, victims of roughly 64,000 disasters turn to neighbors familiar and new—the more than half a million volunteers and 21,000 employees of the Red Cross. Through over 264 locally supported chapters, more than 15 million people gain the skills they need to prepare for and respond to emergencies in their homes, communities and world. Some 2.8 million people give blood—the gift of life—through the Red Cross, making it the largest supplier of blood and blood products in the United States. And the Red Cross helps thousands of U.S. service members separated from their families by military duty stay connected. We have seen the Red Cross at work right here in our communities. This past summer when a large fire struck an apartment fire in Prospect Heights, the Red Cross was there to provide food and shelter to the hundreds of people immediately left without a home or any belongings. Within hours, another large fire broke out at a 95-unit apartment complex in Bolingbrook where every person who lived there had to be evacuated. The Red Cross brought a food truck and opened a reception center to keep everyone comfortable during that time. Culema Herrera’s uncle, Jaime, lived at the apartment complex during the fire and says that the Red Cross was really helpful during the stressful time. “We feel really fortunate that you were there to help us and give us the information we needed right then,” Herrera said. Whether a disaster affects one family or hundreds, the Red Cross is there to help. Join the world’s largest humanitarian network this #GivingTuesday. Thank you for your support. The American Red Cross prevents and alleviates human suffering in the face of emergencies by mobilizing the power of volunteers and the generosity of donors. Learn more: https://youtu.be/PdgEJ6sLL0Y.